‘The Arab Spring in the autumn of capital’ was written at the end of November 2011 by ‘Friends of the Classless Society’, based in Berlin. Originally in German and translated into English, the text was then updated at Aufheben’s request with the addition of a postscript that was written at the end of June 2012. We have published this text because we think that it provides an insightful and at times incisive analysis of what has become known as the Arab Spring. Certainly its analysis serves to puncture the enthusiastic accounts put forward by both mainstream liberals, who have seen the Arab Spring as a series of democratic bourgeois revolutions that will usher in parliamentary democracy, the rule of law and economic property, and the autonomists and left who see the uprisings in the Arab world as a manifestation of an emerging amorphous global anti-capitalist movement. However, it perhaps goes without saying of course, that we have some quibbles. We will mention a few examples. First, at the risk of ‘mentioning the war’, what is striking to a reader of the text outside Germany is the deference the authors pay to the ‘anti-German German left’. This seems to oblige them to take a pro-Israeli stance, presumably for fear of being denounced as being anti-Semitic. Thus, in passing, we are given the picture of a plucky little Israel repeatedly taking on and defeating goliath in the form of the mighty Arab states. Their attempt to distinguish a ‘communist critique’ of Zionism as simply a national liberation ideology from the ‘necessarily anti-Semitic’ critique put forward by the left seems to us to be too simple if not a little feeble. Yet the question of Israel and Zionism is rather tangential to the main argument of the text. It certainly does not serve to obscure the important point they make that – to the surprise and consternation of much of the left – the question of Palestine has not been much of an issue raised by the movements of the Arab Spring. Second, their analysis of the class composition of the Arab world seems to us to gloss over the importance of the petit-bourgeoisie particularly as organised within the bazaar. We would suggest that the Middle Eastern petit-bourgeoisie, and in particular its relation to the proletarianised surplus population, has been vitally important in the history of the Middle East – for example in the triumph of Islamism in the Iranian revolution of 1979 and in the Baathist revolutions in the 1950s. It is also likely to be a major determinant in the development of the Arab Spring. Third, and perhaps more importantly, is the notion of the decline of capitalism (or the capitalist relation as they would have it) that serves to frame the text. This is most evident in the very title ‘The Arab Spring in the autumn of capital’ and in the conclusion of the postscript, but it is a notion that is implicit throughout the text. This would seem to be based on the fact of the large scale proletarianisation, and the creation of a surplus-population, in both the Middle East and across the world. For the Friends of the Classless Society this, it would seem, has created the conditions for world communism. This is not the place for an extended argument over this issue - and we must admit that we are not familiar with the theory upon which they base this notion of decline – but we would point out that even if such proletarianisation, and the creation of a surplus-population, is a necessary condition for the end of the ‘capital relation’ it certainly is not a sufficient one. Indeed it must be said we are not interested in scholastic ‘proofs’ concerning the existence of God or the abstract possibility of communism that has come to bedevil what now passes for the ultra-left - particularly at a time when a universal caliphate would seem a far more likely prospect than world communism. Indeed, what attracted us to this text is that despite any theoretical shortcomings it might or might not have, it is a serious attempt to analyse the concrete situation in the Middle East that has given rise to the phenomena of the Arab Spring. It is certainly a good starting point for debate. Meanwhile, the fundamentalist oil sheiks in the Gulf states, who had always felt threatened by Arab socialism, saw their power increase greatly when they were able to deflect a further debacle for the Arab states in the Yom Kippur War of 1973 when their oil embargo on Israel's western allies caused the oil price to soar. The decline of nationalism in a progressive-socialist disguise and the rise of the Gulf states' Wahhabist rulers coincided temporarily with, and caused a profound transformation of, the whole region: the labour migration to the Gulf monarchies on the one hand and the circulation of the oil rent through a network of Islamic banks and investment funds on the other signalled the end of the national development framework. This is the backdrop against which the rise of Islamism took place. Not only did it inherit the role of Arab socialism as the dominant anti-imperialist ideology, but it found its followers in the growing mass of the surplus population and in the “devout bourgeoisie” doing business with the Gulf states or working there occasionally. In the sense that the fundamentalist oil sheiks supported it with all their might by building mosques everywhere and distributing religious literature, one might very well label this “Petro-Islam”: “the Wahhabization it implemented had tended to fluctuate with the price of a barrel of oil”.6 Among the unpropertied classes, the slum inhabitants who have no access to regular wage labour are mainly the ones to whom religious promises of salvation and the Islamists' soup kitchens appealed as a result of their miserable material situation. The working class in a narrower sense going face to face with the class enemy on a daily basis, on the other hand, was less susceptible to the class harmony – garnished with a little charity – that the Islamists preached. In this sense, the rise of Islamism indicates a shift in the composition of the Arab proletariat. Compared with the poorhouse Egypt, the situation in Tunisia appears a little better, but is fundamentally very similar. After the short state socialist interlude in the 1960s, an all-encompassing authoritarian state remained here as well, mercilessly pushing through economic reforms at the expense of the proletarianized in the 1980s; hundreds died in strike waves and riots fighting this trend. Ben Ali's highest priority after his coup was the implementation of measures dictated by the IMF in exchange for relief in the state budget crisis: privatizations as well as cuts in social spending and food subsidies.9 The historical tendency of the dissolution of the peasantry was even stronger here and the percentage of those working in agriculture fell to 16 per cent, without those released from agriculture ever being able to be absorbed by a dynamic capitalism: the relatively developed cores are marked by service jobs with miserable pay, in tourism but also in call centres outsourced from France; industry is limited to sweatshop suppliers for European companies providing unskilled jobs that pay a fraction of the wages in Europe; the interior is marked by extreme poverty: in the mine region Gafsa, the site of repeated unrest, for example, unemployment is at 40 percent; and particularly in the cities, the population, above all the youth, is shown clearly that its labour power is not needed. In Tunisia, much like in Egypt, the historical backdrop of the struggles in 2011 is marked by the fact that the peasants that dominated the era of anti-colonialism have been replaced by a population that is proletarianized, urbanized and well-educated, but excluded from prosperity and ruled by a state that makes the population feel the decline in value of its labour power through harassment and police violence. Even some capitalists who somehow managed to be successful without any close ties to the regime sided with the uprising, because they considered themselves to be at a disadvantage in the nepotistic system, because they do not hold the necessary reins and long for legally binding regulations that everyone has to abide by, thereby guaranteeing fair capitalist competition. For example, an Egyptian textile capitalist expressed his sympathy for a strike in a state-owned textile factory. He certainly did not have the well-being of the workers on his mind, but rather the unfair public sector competition not being required to pay its workers the same minimum wage he himself was required to pay.10 Bribing government officials and paying protection money to corrupt police officers is part of everyday life for many businessmen. Also, they fail to see why the government offices making important political and economic decisions are held by the incompetent nephews, cousins, and friends of the governing few, while those who have been educated to do this kind of thing are selling oranges on street markets. Therefore, the regimes had opponents even within the ranks of the propertied class and western liberals' hopes that the market economy would really take off after the end of “crony capitalism” were based in part on them. They were, however, rather irrelevant for the despots' toppling, not least because of their weakness in numbers, and attempts to make cracks between the different ruling factions – those with a more statist orientation and with close ties to the military, and those more oriented towards neoliberalism close to Mubarak's son – responsible for the upheavals in Egypt ignore the fact that their power was drawn from the streets that were not populated by masses of frustrated small businessmen and fat cat capitalists. The unruly youth was often named as the central, almost the sole, agent in the uprisings; not surprisingly, as the spectacle would rather talk about generational than about class conflicts; two Middle East experts from Germany simply called the unrest in the Arab world a “rebellion of the young Mittelstand”.11 The wishful thinking of western liberals only contains a grain of truth to the extent that educated, urban, secular, internet-savvy youths made up a large part of the early protests. They organized these protests themselves without any leaders or political parties; they have had it with Islamist promises of salvation and also care little for anti-imperialist ideologies – anti-Americanism and hatred of Israel did not play a role during the protests and because of this it is hardly surprising that the uprising struck more fear in Hamas honchos than in Israeli school kids. They were, however, soon joined by people from the suburbs who did not have an internet connection and, in many cases, could not even read or write. They, in turn, soon mixed with the rural poor, workers and middle-class people of all ages. In Tunis, youths from the under-developed parts of the country camped in the city and contributed to the regime's fall. In Egypt, the military did not oust Mubarak until workers' strikes flared up and even threatened to bring the Suez Canal to a standstill. This is exactly what is now on the agenda. While many young protesters are committed to the liberalization of the economy, for workers who had spent their whole lives under the control of the police state and the state-controlled unions, the point of the uprising was to gain the legal freedoms for their economic struggles and to allay their material misery. These tendencies were united in the uprising but now point in opposite directions. Despite the military council's anti-strike decree, post-Mubarak Egypt has been hit by a wave of strikes and workers' unrest that destabilize the situation and scare off both domestic and foreign investors.14 These struggles are by no means the result of revolutionary exuberance: they are a struggle for independent unions, minimum wages, and fixed contracts. With their calls for a maximum wage for managers and for governmental investments, these struggles have a genuinely social democratic touch to them, striving for “social justice”, and workers often emphasize that they only want to make their contribution in building Egypt. But this is a throwback to an era that ended decades ago in which national development and workers' prosperity went hand in hand. Though the situation is not as critical as in Egypt, future governments in both countries will face the challenge of reining in a huge surplus population and masses of workers whose reason for risking their lives in the uprising was hardly just wanting the chance to take part in real elections. Particularly in Egypt, this instability could even derail the announced transition to democracy. The military council has plotted to instigate riots against the Coptic minority, in order to be able to appear as a guarantor of law and order, well knowing that they are sitting on a social time bomb. The conflict with Israel to which the rebels did not really pay attention to at first could now enter centre stage as a welcome kind of lightning rod to distract from the real issues. In the summer of 2011, Perry Anderson, the grey eminence of the British New Left, contritely remarked that the recent Arab mass movements had “not produced a single anti-American or even anti-Israeli demonstration” - a bitter disappointment for someone who would like to see Nasserism and Baathism revived as the ‘‘higher idea of an Arab nation’’. But now, the tide appears to have turned: when it is not the Muslim Brothers, but the opponents of the Egyptian military council rioting in front of the Israeli embassy and the newly founded independent trade union federation proudly declaring “hostility towards Israel and Zionism, and refusal to deal with any entity or person that normalizes relations with Israel” as one of its central tenets, the step forward the rebels took by not taking their discontent out on the Great or the Little Satan, but rather locating the main enemy at home, appears to be in the process of being reversed. Particularly in this respect the Arab world is an anomaly: the employment rate for women is at just over 30 per cent in the Arab countries of north Africa, the lowest rate worldwide.18 Since the 1960s, urbanization has caused the birth rate to plummet to nearly European levels. According to the World Bank's 2009 figures, an Egyptian woman has an average of 2.8 children, one in Morocco has about 2.3, and in Tunisia and the United Arab Emirates the rate is even at 2.0 and 1.8 respectively. Accordingly, the educational attainment level of women has risen significantly, as they make up two fifths of university students in Egypt and over half in Tunisia. Therefore, it is not surprising that liberal economists often point to the comparatively low employment rate of women as an important index for those countries' lack of competitiveness in the global market: the fact that well-educated female manpower is banished to the household to take care of children or to wash the dishes is an almost unnatural waste of productive resources for them.19 However, the real background to this situation is the previously mentioned tumbling price of human labour power – the enormous surplus population resulting from capital's inability to absorb the existing labour power. For one thing, domestic reproduction labour, almost exclusively done by women, becomes more significant for securing an ever more precarious survival. Secondly, it is highly doubtful that male proletarians will support the level of competition on the labour market being intensified even more through the intake of female workers. The regressive tendencies in gender relations have to be viewed in this context and the hope that the gender question will be automatically solved in the course of capitalist modernization processes has to be given up for good. In the end, it will all depend on whether women (and men who side with them) are able to transform the hopes and expectations that arose in the uprisings into a movement against the existing gender relations. The space for an emancipation within the framework of capitalist modernization appears to be limited – whether women, empowered by the spirit of the revolt, will (have to) give up their desk and classroom for the stove and kitchen will be decided by the shift in power between men and women. The Islamists' electoral victories in Tunisia and discussions of strengthening sharia in Libya show that religion as a stabilizing force could gain momentum in face of the precarious social state of affairs; Islam, even if it is devoid of fundamentalist excesses and tuned to good relations with the west, will stand in the way of the long overdue revolution in gender relations. The Arab unrest could almost lead one to an ideology of development, the core of the stage model of national-democratic and proletarian-socialist revolutions at the centre of twentieth century Marxism: struggling for things that the bourgeois state grants its subjects in the developed countries, like the right not to be thrown into a torture chamber for remarks unfavourable to the government or to organize trade unions with one's colleagues, but do not come close to touching upon the existing mode of production. However, first of all, this stage model was nothing short of the Bolshevist alternative to the world revolution from the early twentieth century on;20 secondly, the national-democratic revolutions already took place decades ago (and were about as democratic as the state capitalist people's democracies in the east, enormous frauds in other words); and, thirdly, even though the Arab world lagged far behind Europe and North America in this respect, the conditions for a global revolution against the capital relation have already been created under the auspices of the regimes that gained power through these revolutions. 5. Joel Beinin, Workers and peasants in the modern Middle East, Cambridge 2001, p.141. 6. Gilles Kepel, Jihad: the trail of political Islam, London 2002, p.73. 9. Cf. Beinin, Workers and Peasants, p. 154-156. 10. Rainer Hermann, ‘Ägypten: vorgeschichte und nachwirkungen’, Frankfurter Allgemeine Zeitung, 20th February 2011. 11. Frank Nordhausen/Thomas Schimid (ed. ), Die Arabische revolution, Berlin 2011, p.10. 12. More on labour struggles in the run up to and during the uprising: Friends of the Classless Society (ed. ), ‘Revolution in Egypt: interview with an Egyptian anarcho-syndicalist’, Berlin 2011. 13. 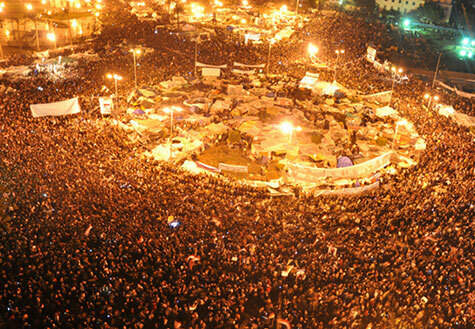 ‘Light, dark and muddle: the shakiness of Egypt's economy could undermine progress towards democracy’, Economist, 23rd June 2011. 14. Cf. ‘Restive Egypt workers pose economic, political threats’, Reuters, 7th October 2011. 15. Helmut Dietrich, ‘Das doppelte Tunesien’ (September 2011), materialien.org. Dietrich's excellent report does, however, ignore the dark side of the class situation: The fact that there were recently confrontations about the allocation of jobs between various “tribes” in the Gafsa mine region that killed eleven people is not mentioned at all. Cf. ‘Eleven killed, more than 100 injured in mine town clashes over jobs’, AFP, 6th June 2011. 16. Mariarosa Dalla Costa, ‘Women and the subversion of the community’ in Mariarosa Dalla Costa, Selma James (ed. ), The power of women and the subversion of the community, Bristol 1972, pp.21-56. 17. More on this as well: ‘Revolution in Egypt: interview with an Egyptian anarcho-syndicalist’. 18. The situation does, however, vary greatly from country to country: in Egypt, Tunisia, and Morocco the rate is highest. In the fundamentalist Gulf states there is only one working woman for six to seven male workers. Libya is an exception among the rentier states. Under Gaddafi's rule women's path to the labour market was made easier – protected by a squad of female bodyguards, he attained the reputation of being sympathetic to women that reached far beyond north Africa. 19. ‘Women and the Arab awakening: now is the time’, Economist, 15th October 2011. 20. The council communists, in their clear-sighted 1934 text, called Bolshevist internationalism the “peasant internationalism of a bourgeois revolution” (‘Theses on Bolshevism’, International Council Correspondence 3 (1934), pp.1-18.). Insisting on the exclusive revolutionary role of the developed proletariat, as the council communists did, basically amounted to admitting that the prospects of a world revolution, which the council communists envisioned a little differently than we do now, are rather poor, if one considers the relation in numbers worldwide at the time. On the historical transformation of revolution and communism cf. ‘Thesen zur Agrarfrage’, the two texts on “communization” as well as the essay ‘Proletarische bewegung und produktivkraftkritik’ in Kosmoprolet 3, Berlin 2011. I have a minor quibble though. They write, "The NATO forces' intervention might have saved the rebels and civilians from massacres by the regime's troops and the civil war might otherwise have cost far more than 30,000 people their lives. " But after the passage of UNSC res 1973 (and, albeit, a French airstrike) Gaddafi had already declared his willingness to agree to a ceasefire. It was the NATO backed NTC which refused to reciprocate. Also the 30,000 dead number does not take into account those that are still dying throughout the region due to the fallout that the civil war in Libya has called, a war which might have been avoided if NATO countries were serious about protecting human beings. The text is from 2011 though, so can hardly be faulted for not accounting for these deaths!